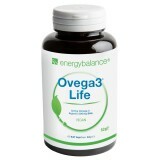 Ovega3™ are the first Omega-3 capsules to feature easy-to-digest soft caps of vegetable origin without gelatin. There is Ovega3™ with organic fish oil that has been certified sustainable by "Friends of the Sea" and with the active Omega-3 ingredients EPA + DHA in combination with three natural antioxidants. 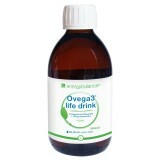 For vegetarians there is Ovega3™ in 100% vegetable-origin vegan form made from algae oil and the active ingredient Omega-3 DHA in soft capsules of vegetable origin, or in drink form for those unable to swallow capsules. Omega-3-fatty acids influence the regulation of blood lipids. Omega-3 are essential fatty acids. Our bodies are dependent on their supply through the food we eat. Omega-3 fatty acids are incorporated into the cell membrane and are crucial for their production and function. EnergyBalance™ Ovega3™ contains an ideal combination of excellent and active Omega-3 fatty acids. Ovega3™ is a unique dietary supplement made from raw materials of the highest quality and bioavailability - yet at an unbeatable price. This can be seen when comparing Ovega3™ fish oil capsules with krill; krill loses in tests. Ovega3™ contains, among others, the most import Omega-3 active ingredients EPA, eicosapentaenoic acid and/or DHA, docosahexaenoic acid. These active omega-3 substances are important for our bodies and cannot be compared to other omega-3 fatty acids, which come in the form of ALA, alpha linolenic acid. ALA, alpha linolenic acid, is not an active substance and first needs to be turned into the active omega-3 substances, DHA, or EPA, by our bodies in a complex process.